Pitcher Plant Necklace is a plique a jour jewelry piece created by Patsy Croft. It belongs to a collection of amazing enamel jewelry with unique jewelry designs. Capturing nature and beauty using classical techniques in contemporary designs. www.patsycroft.com for unique, brilliant, timeless jewels. This jewel was my first adventure into the fabulous art of plique a jour. Plique-à-jour (French for “letting in daylight”) is a vitreous enamelling technique where the enamel is applied in cells, similar to cloisonné, but with no backing in the final product, so light can shine through the transparent or translucent enamel. 1. Filigree plique-a-jour (“Russian plique-a-jour”): This is a building up process whereby a planned design is interpreted using gold or silver wires which are worked over a metal form (i.e. bowl). Wires are twisted or engraved, e.g. have additional micro patterns. The wires are soldered together. Enamels are ground and applied to each “cell” created by the metal wirework. The piece is fired in a kiln. This process of placing and firing the enamels is repeated until all cells are completely filled. Usually it takes up to 15-20 repeats. 2. Pierced plique-a-jour (“Western plique-a-jour”): A sheet of gold or silver is pierced and sawed, cutting out a desired design. This leaves empty spaces or “cells” to fill with enamel powders (ground glass). 3. Shotai shippo (“Japanese plique-a-jour”): A layer of flux (clear enamel) is fired over a copper form. 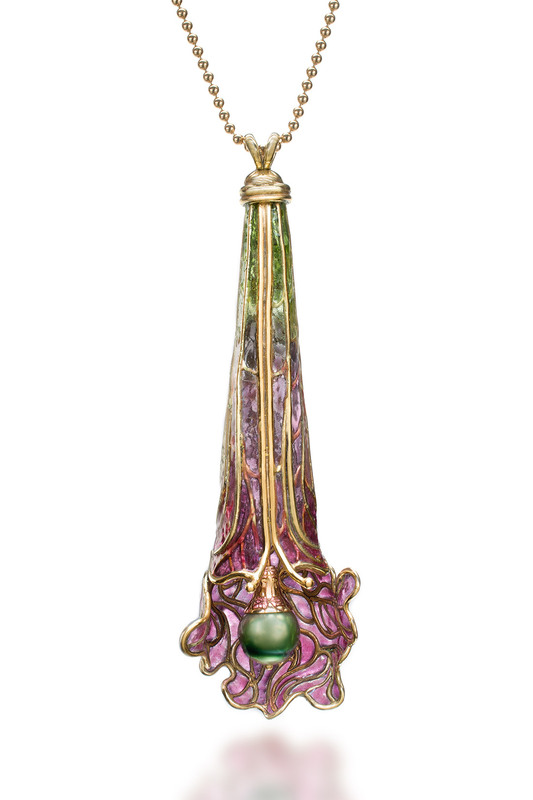 Wires are fired onto the flux (similar to cloisonné) and the resulting areas are enameled in the colors of choice. When all the enameling is finished, the copper base is etched away leaving a translucent shell of plique-a-jour. 4. Cloisonné on mica: Cells in precious metal are covered with fixed mica, which is stitched out with abrasives after enameling.